Two sets of sleepy eyes wearily scan the kitchen for something to dull the pain they feel in their bellies. Frankie spies a couple of now crisp tortillas on an old, chipped plate next to the stove. He sprinkles one with salt then folds it in half and hands it to his younger sister, then does the same with the second one before taking a crunchy bite. Some coffee remains in the bottom of a pot on the stove, left by their parents who were up and gone on the search for work at the crack of dawn that morning. Once Frankie and his little sister have finished the coffee and tortillas, they start their long walk to school...in the same rumpled clothes that they woke up in. Before they even make it to the schoolyard, Frankie's little sister tugs on his sleeve. "I'm hungry, Frankie." Frankie picks a fight...winner gets one of the losers tacos. He knew he'd win. He didn't have any other choice. The look on his sisters face is worth the punishment Mr. Stern will hand out. The lessons pass while Frankie fidgets uncomfortably in his hard chair. He realizes that Mr. Stern has called on him and is waiting on an answer to the math problem he's written on the board. Frankie doesn't know the answer...he can't concentrate...he doesn't even remember how to work the problem. He takes the punishment that is doled out, willing the bell that symbolizes fresh air to ring. On the walk home, he plucks a couple of oblong fruit from one of his neighbors trees and hopes that his mom found a house to clean...or that his dad is home from playing music next to the big market. He silently pleads with the brightest hope that they will eat dinner tonight. In American alone, 17 million children do not have the means to get proper nutrition. Lack of proper nutrition means that children are more likely to get sick...and that it takes them longer to get better. Lack of proper nutrition means that they are more susceptible to catching a cold or getting an ear infection. They're more likely to experience fatigue and headaches. Proper nutrition is essential for children...it helps them concentrate in school...without a good meal, how can they learn!? Lack of proper nutrition predisposes kids to both emotional and behavioral difficulties and problems...it causes anxiousness and aggressiveness. Teens who don't get enough to eat are less likely to get along well with others and get suspended from school. ONE IN FOUR CHILDREN IN AMERICA TODAY IS FACING HUNGER*. I can make a difference. You can make a difference. WE can make a difference. This week, more than 50 bloggers are setting our virtual tables and Sharing Our Strength to raise awareness about childhood hunger in the United States during this holiday season. Our table will be set over the course of a week. It started Monday with appetizers, Tuesday with drinks, and today we are bringing out the salads. I feel blessed beyond belief to be able to set food on my table and share it with you today. Please, join us in our fight to help end childhood hunger in America. No Kid Hungry. 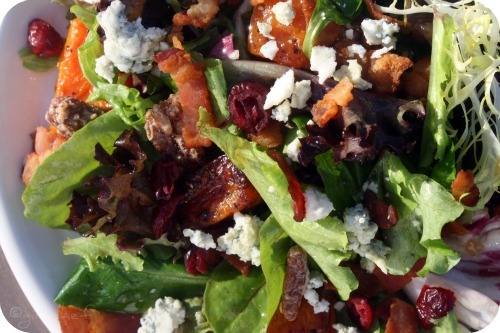 Once the butternut squash, pecans, and bacon are cooked and the vinaigrette is made, the salad goes together quickly. Be sure to have everything out and ready right before service. Since this is tossed in a warm vinaigrette, you want to dress it at the last moment. Also, this is a very free-form salad, so I've listed approximate amounts you'll need per person so that you can easily adapt it to fit your needs. No need to peel the butternut squash, once roasted it gets all chewy and delicious! Preheat oven 450° F. Line a sheet tray with parchment paper. 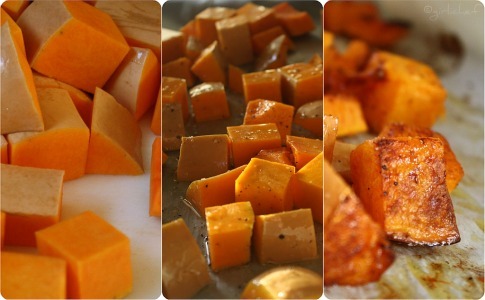 Toss cubed squash w/ a drizzle of olive oil, a couple pinches of salt and gratings of black pepper. Place in hot oven and roast, tossing it around about halfway through, ~30 minutes or until tender and caramelized a bit. Remove from oven. When you're ready to serve, toss a portion of your lettuce greens with enough warm vinaigrette to coat lightly and toss...you don't want your lettuce to drown, have a light hand...you can always add more. Tumble the rest of your ingredients over the salad and enjoy! You will probably have a bit of vinaigrette left over, but it refrigerates well. Simply re-heat it and shake it up when you want to use it again. Place apple cider, apple cider vinegar, and shallots in a medium pot and bring to a boil. Lower to a simmer until reduced by a bit more than half…almost two thirds. Whisk in olive oil, maple syrup, and Dijon. Season to taste with salt and pepper. Dress salad while warm or let cool, transfer to jar and store in refrigerator. Bring everything except nuts to a boil. Reduce heat to medium and let it bubble away until it is very reduced and sticky, watching closely. When the liquid is near evaporation, toss in the pecans and stir around quickly. Spread them out on a parchment lined baking sheet to cool. Break apart any halved that stuck together. Try to resist! Over the next few days we'll add Soups, Entrees, Sides, & Desserts to our table...please click HERE to see them. Thank you. I work in low income senior housing, hunger sometimes lasts a lifetime. this sounds amazing. I love candied pecans in salads. Lately we've boycotted nuts though my son keeps exploding from allergy sensitivities. :( I'll pretend I was able to eat yours because its super pretty! I'm a huge Ina Garten fan. This vinagrette looks great- I've been hunting for some new salad dressing ideas and this definitely fits the bill. I'm honored to be a part of this event - thank you for including my blog in your link list. My blog link didn't work for some reason. 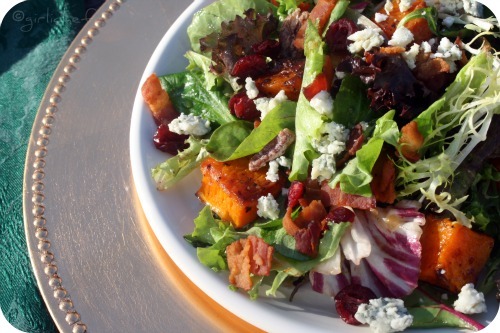 Your salad looks divine, especially the roasted squash and the maple dressing - can't wait to try this one! Again, thank you for including me in your link list. It was an honor to be a part of this event. Anything we can do to help children in the battle against hunger is worth pursuing. This does sound incredible...from the cranberries to the nuts to the butternut squash...I could see this as the perfect addition to my holiday table. But thank you for highlighting such an important issue and worthy cause. It breaks my heart to think about the poverty in my own community. Thank you for sharing. I hope you have a lovely afternoon, my friend! Mmmmm,this salad sounds absolutely fabulous! I'm so glad to be participating in this great event! Thanks so much for including my blog in your links! This sounds fab! Colourful, delicious and nutritious! The salad looks very fresh and flavoursome! This looks divine! Thanks for participating in our Share our Holiday Table progressive holiday party! A beautiful salad for a great cause! The warm cider maple vinaigrette sounds so delicious with the roasted squash. Great post Girlichef! I was so drawn in and such a worthy cause...great recipe here too! Not only is it a beautiful salad, that cider maple dressing sound divine! The leftover roasted squash I have may just end up in a salad tonight! Heather this is such an absolutely wonderful cause! Your story at the beginning gave me chills. I love this salad! I made something similar not too long ago. Minus the bacon. That was a mistake. What a moving post! And this salad looks absolutely delicious. Thank you for linking up at my squash blog hop! Eloquent writing for a worthy cause. And a delicious salad!